I'm not normally one for subscription boxes that have become so popular lately, because I'm fairly against the idea of spending money on random stuff that I may or may not like and that I definitely don't need. It seems like both an unwise financial decision and a way to accumulate needless clutter. If you know me, you know that both of these things make me itch. That said, I do have a NatureBox subscription, because the whole family consistently likes their stuff, I can pick what I want in the box, the price is reasonable, and it gets used up every month. 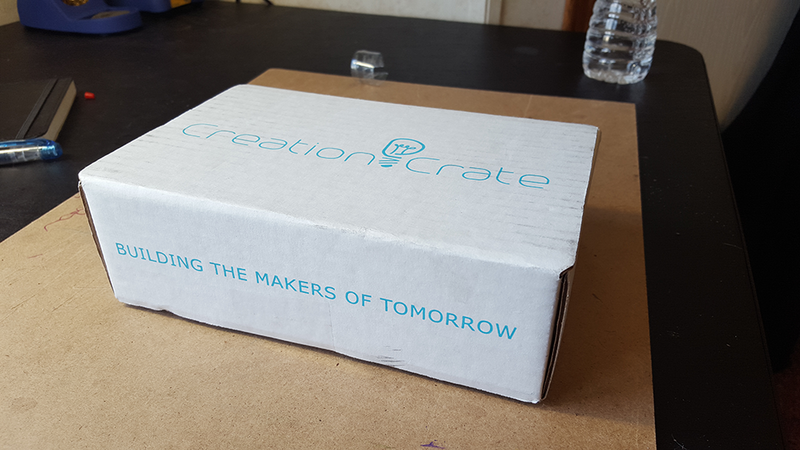 When I came across Creation Crate I immediately got a similar, but deliciously nerdier vibe. It appealed to the part of me that wants to make stuff and the part of me that wants my kid to learn to make stuff. It's not just a box of random vinyl figures and geek kitch, it's an educational experience where components get used up in the creation of some finished project. Those pieces are also recyclable into other projects. 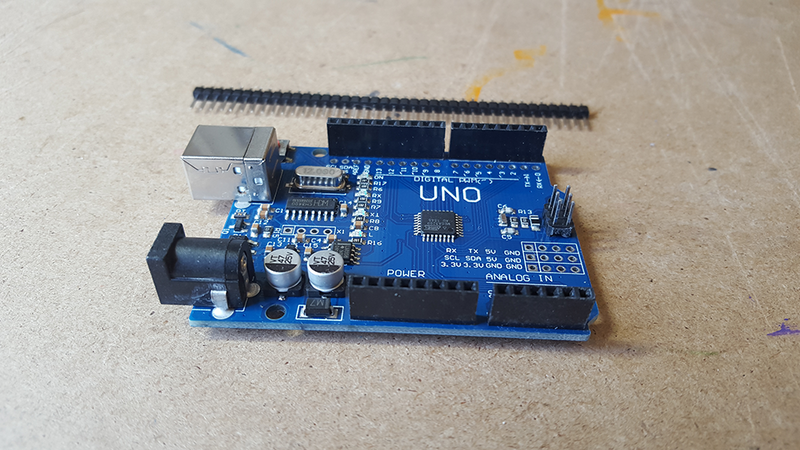 I may eventually end up with a shoebox full of Arduinos, I thought to myself, but imagine what I could do with dongle of Arduinos (I maintain that "dongle" is the perfect word for a herd of small microcontroller boards and should be adopted as such, despite its actual meaning). So I signed up! About three days later, I got a shipping notification, and about a week after that, I got the box. Cool - smaller than I expected, but I have no logical reason for why I expected larger. I just did - even though I knew what to expect inside. 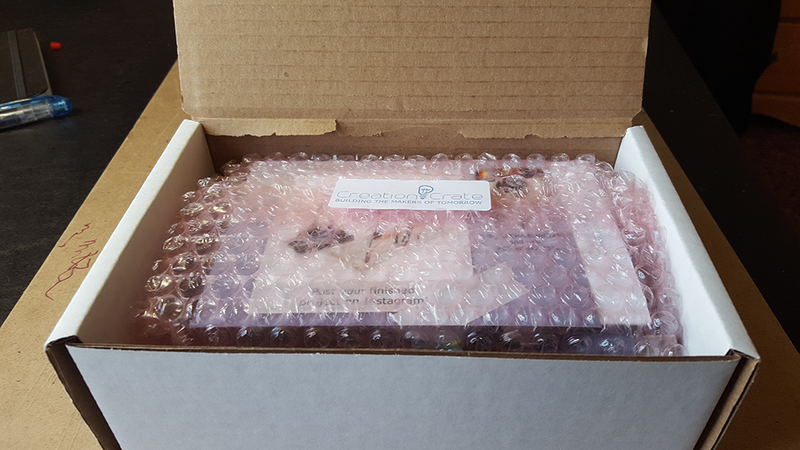 Everything was well packaged and wrapped in bubble-wrap for that long trip from Alberta to Kentucky. I know it's a long trip, because I've made it by Greyhound bus many times, often while wishing I was encased in bubble wrap. 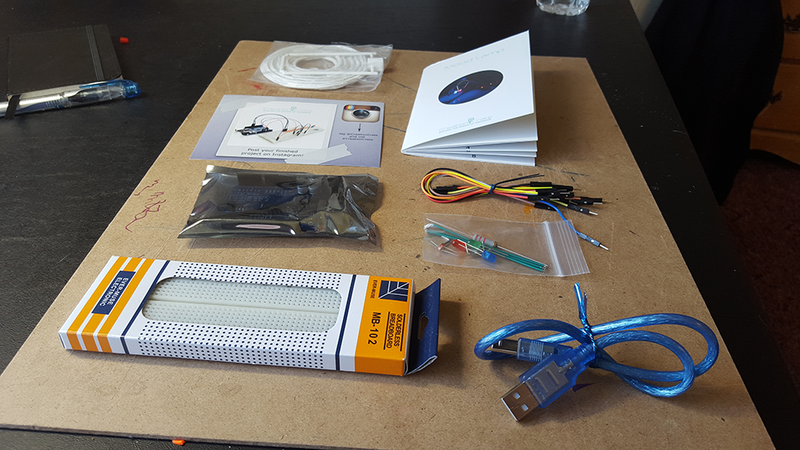 Inside we find a bunch of goodies - a paper lantern to put over the finished lamp (it's an RGB light-sensitive mood lamp that we'll be building), jumper wires, LEDs, a light-sensitive resistor, a breadboard, a USB cable, and an Arduino Uno with some header pins. 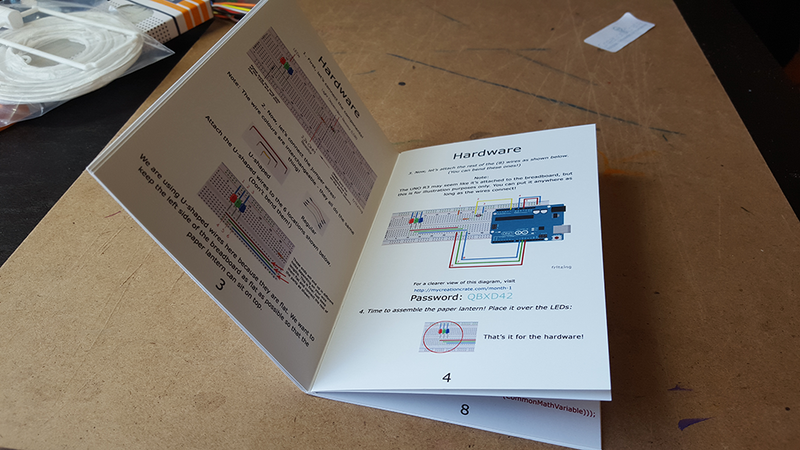 Also included is an excellent, full-color instruction booklet containing wiring diagrams and step-by-step instructions for both building and programming the project - complete with a troubleshooting section for common problems. My first impression here is pretty positive. Everything is well packaged and well thought-out. The instruction manual is really top-notch. At $28/box shipped if you pay monthly (which is what I did for this first box), yes, you could buy the individual components cheaper. However, what you're really paying for here is the lower barrier to entry on learning all of this stuff. The components arrive and they include just exactly what you need, with everything guaranteed to work together. There's no guesswork in "did I buy the right type of resistor?" or "is my software compatible with my chipset?" - Things like this are valuable to learn, but they have no place in a beginner project meant to capture the imagination and maker spirit, espeically of kids, who the box was originally targeted toward. This, plus the very thorough, well laid-out, well written instructions, and the freely available source code are worth the added cost alone. It's also worth noting that these boxes aren't random. You get them in a specific sequence, each building on skills learned in the previous box, so their educational value remains high and the knowledge gained is cumulative. I'd hesitate to pay more than about $30, at least for these earlier boxes, but I don't feel in any way cheated or gouged at this price point. So what about actually building the project? Well, we'll find out this weekend, because I'm not going to be the one building it. I may be asked to step in and help here and there, but my daughter laid claim to the box and its contents roughly twelve seconds after seeing it. 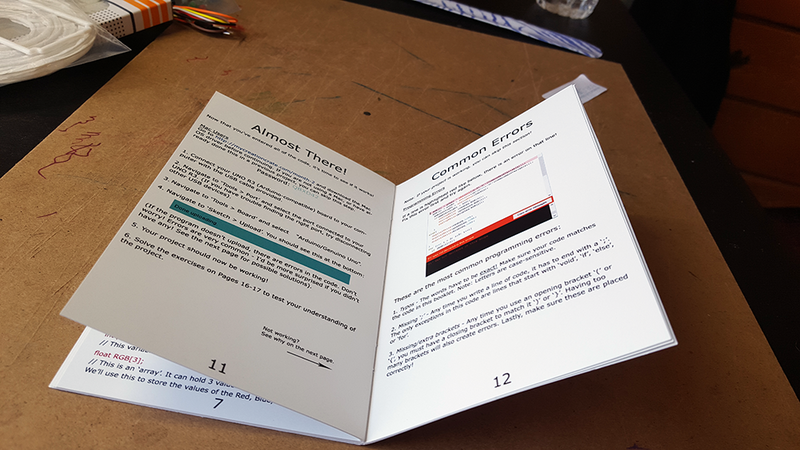 For a kid who loved the electronics summer camp when she was twelve, but who has been (much to my dismay) lukewarm on the idea of learning to program, the prospect of taking on and making the whole project from scratch instantly appealed to her. So we'll see how it goes and I'll report back with more photos and thoughts (mine and hers) after she's built it.